Containers enter the gravity filler filling area in groups. When the last container in the group passes the mounted counting sensor, a pneumatic gate will engage and prevent other containers from interfering in the filling process. A product aligner engages the necks of each container, centering it under each fill nozzle, and the nozzles will lower into the opening of each container. Once seated on the opening of the bottles, the fill tubes will be opened and as air exits the container, product will flow in from the product tank. The fill level in each container is controlled by the position of the vent tube, so it is a fill-to-level principle. When product reaches the vent tube the excess recirculates back into the product tank. The cycle of the gravity filler is time-controlled and fully adjustable. When the cycle completes, the fill head elevates, the fill valves close and the neck guides retract. Finally, the pneumatic front gate releases allowing your filled containers to exit. The product level in the tank is managed by sensors controlling a pump which will pump product into the tank from your supply. Available in 4 or 6 heads. 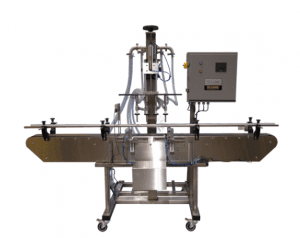 Based on a fill-to-level principle, the Model GO-8 Gravity Filler delivers a quantity of flow-able liquid into the container until it reaches an adjustable fill height. Excess liquid then flows through the overflow vent back into a tank until the time cycle is complete and the filling head retracts. This is the ideal filling style for a wide variety of product and container types. The GO-8 starts with eight 316 SS mechanical filling nozzles mounted for complete adjustment to bottle sizes ranging up to 3 ½” diameter. 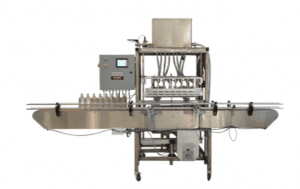 Pneumatic escapement gates control the containers while neck guides control the container openings under the filling nozzles. Automatic level control using ultrasound sensors ensure that the product level (and thus fill time) are carefully controlled in both the product and overflow tank. A stainless drip tray ensures clean transitions between containers. Fully adjustable escapement gates with “first-in, last-in” photo-eyes for container detection. Fully adjustable 316SS filling nozzles. Integrated drip tray and neck centering guides. Centralized main conveyor motor allows configurable conveyor with clean transitions. Speeds to 60 cpm based on product and size. Integrated container Rinser can be added to the infeed end to wash out containers. Rinser is controlled with the touchscreen and works together with the gravity filler. Integrated Air Cleaner can be added to infeed end to wash out bottles. The Cleaner utilizes ionized air and is controlled within the touchscreen and works together with the filler. Modular built-in 42” Feed Table and conveyor ends bolt into main filler conveyor for precise transitions in bottle feeding. 3A and Sanitary upgrades are available. Based on a fill-to-level principle, the Model OF Pressure Overflow Filler delivers a quantity of flowable liquid into the container until it reaches an adjustable fill height. Excess liquid then flows through the overflow vent back into a tank until the time cycle is complete and the filling head retracts. This is the ideal filling style for a wide variety of product and container types. 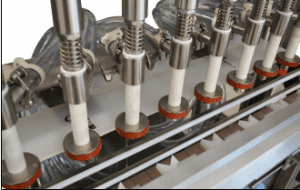 The OF starts with four nozzles and is expandable up to 12 316 SS mechanical filling nozzles mounted for complete adjustment to bottle sizes ranging up to 3 ½” diameter. 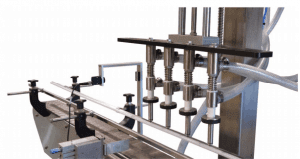 Pneumatic escapement gates control the containers while neck guides control the container openings under the filling nozzles. Automatic level control using mechanical float ensure that the product level (and thus fill time) are carefully controlled in the product and tank. A stainless drip tray ensures clean transitions between containers, and a drip tray under the conveyor assists in spill control. A 6” touchscreen allows fine control of all manual and automatic functions, including saved recipes for various packages and supports cleaning protocol through full manual control of each device. A 10” centralized stainless steel main conveyor is included with variable speed control and super-clean conveyor ends for easy transitions. Fully adjustable escapement gates with counting photo-eye for container detection. controlled with the touchscreen and works together with the filler. air and is controlled within the touchscreen and works together with the filler.